Though Antigua and Barbuda’s elections were postponed from an originally planned date in March, the result was perhaps worth the wait, bring an end to Baldwin Spencer’s decade-long rule as prime minister. 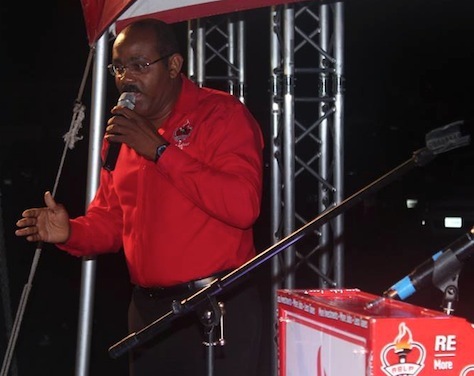 On June 12, Antiguans and Barbudans instead turned to Gaston Browne, the leader of the Antigua Labour Party (ALP), which won 14 out of 17 seats in the House of Representatives, leaving Spencer’s United Progressive Party (UPP) with just three seats. Browne (pictured above) campaigned on turning around the country’s struggling economy, unemployment and high crime. At 47, he’ll become the country’s youngest prime minister. Almost immediately after taking office, Browne signed a memorandum of understanding with a Chinese investment firm for a $2 billion project to develop greater tourism infrastructure. The ALP has long been the dominant party in the country’s political history, even before independence. Its founder, Vere Bird, served as chief minister, then premier, for all but five years between 1960 and 1981, then as Antigua and Barbuda’s first post-independence prime minister from 1981 to 1994. His son, Lester Bird, served as prime minister from 1994 to 2004, when Spencer led the first non-Labour government in nearly 30 years after rallying against corruption from the Bird/ALP era. Spencer narrowly held his constituency in St. John’s Rural West, while Lester Bird, who relinquished the ALP leadership in 2012, won election in St. John’s Rural East at age 78. But the country today faces a staggering economic crisis, and voters seemed to have lost faith in the Spencer government, which struggled at times to pay public salaries. With just 81,000 people, Antigua and Barbuda is the 17th most populous country in the Caribbean, largely living on the country’s largest island, Antigua — with around 1,600 people living on Barbuda. A British colonial holding since the English first arrived in 1632, barring a French interregnum in 1666, the country won independence in 1981, though with Queen Elizabeth II remaining the country’s head of state. Its economy is heavily based upon services, with tourism representing over half of the country’s GDP, though the Antiguan industry never quite recovered from the 1995 hurricane season, which destroyed many of Antigua’s hotels and other tourism infrastructure. Antigua’s attempts to diversify into offshore banking haven’t entirely worked out well, given that it’s often found itself at the punishing end of financial sanctions from the United States and the European Union. Infamously, Allen Stanford chose to relocate his operations for the Stanford Financial Group in Antigua, where he held dual citizenship before he was apprehended by US federal agents in 2009 on fraud charges over what involved a Ponzi scheme that defrauded investors of $7 billion. While Stanford was convicted in 2012 and sentenced to 110 years in prison, the collapse of Stanford’s Antiguan empire caused something of a financial crisis on the island, and exposed the cozy corruption between Antiguan government and finance.